Rolo is a chocolate brand that originated in the United Kingdom in 1937. It was first manufactured by Mackintosh but was sold to Nestle after seven years. Productions in the US are licensed to the Hershey Company. 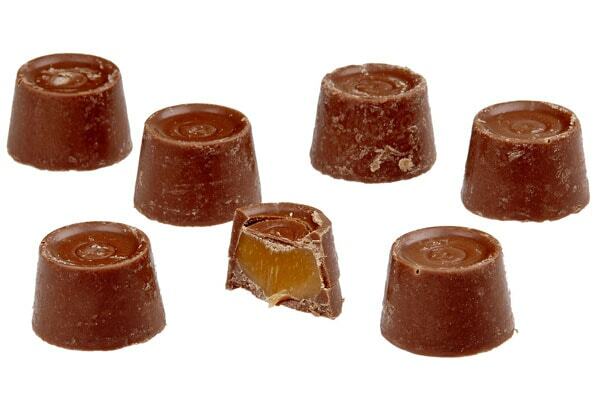 Rolo is a lampshade-shaped chocolate with caramel in the center. During its first manufacturing stage, it was made up of Mackintosh’s signature toffee and coated with chocolate. When it was transferred to Nestle in 1994, variations of the Rolo chocolate where created. Rolo-flavored ice cream, biscuits, birthday cakes, muffins, doughnuts, desserts, cake bars, yoghurts, Easter eggs, and big and mini Rolos were created as the chocolate became popular in the UK. In 2011, fast-food giant McDonalds did a cross-branded product with Rolo and created a Rolo-flavored McFlurry on their menu. It consisted of chocolate pieces and a thick caramel sauce all mixed up with vanilla ice cream. The New England Confectionery Company acquired Rolo when it was exported to the US. It was only in 1969 when The Hershey Company took over the production and selling. Initial Rolo chocolates had their wrappers indicated that they came from the UK when they were manufactured within the US. Rolo’s advertisements go around the line “Do you love anyone enough to give them your last Rolo?” for many years. One of their advertisements called “Elephant” won an award at the Cannes Lions International Advertising Festival in 1996. Several recipes with Rolo as an ingredient are posted on Hershey’s website. They include Rolo Pretzel Delights, Hidden Rolo Cookies, and Rolo Brownie Truffles.